We create frenetic lifestyles. Working; running after families; playing with social media; time on the internet (maybe too much time); the never-ending household chores; exercising – all contribute to the sense of constant busy-ness. Like running on a continually moving treadmill without a stop button! I’m guilty of not catching up with friends as often as I would like for these very real reasons (or should I say excuses?) When an opportunity to spend time with a couple of close girlfriends who I’ve not seen for a while (because of the running treadmill known as life,) I marked it on my phone calendar as a special event. It just happens with these gal pals, I am the first to celebrate a milestone birthday (the big 5-0.) 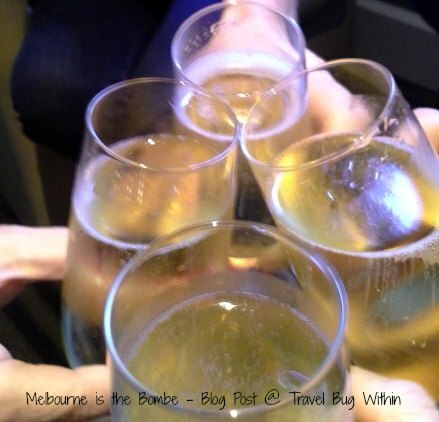 How to celebrate it was a complex issue, but a few conversations sorted the dilemma – a girls only long weekend away in Melbourne. Planning our weekend getaway in the Southern sister city for April, we were hoping for cooler temps than Brisbane. But on the morning of our departure, the Today’s show trusty weatherman, Stevie Jacobs revealed temps ranging from minimum nine to a max of 20. That’s not chilly! When our driver – George – collected us from Melbourne airport, he advised the weather in Melbourne will be “agreeable” this weekend. 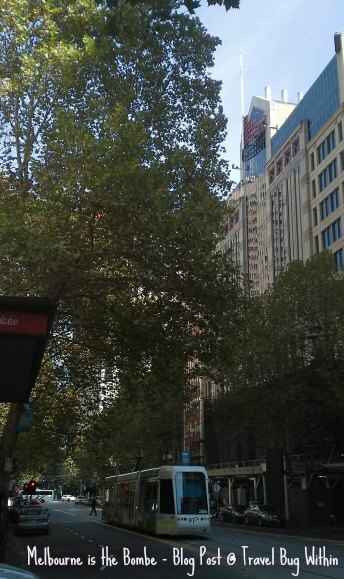 Not sure what he meant by agreeable, but it was exciting to see sunny skies on the drive to our Hotel – the Intercontinental Melbourne the Rialto, on Collins Street. Chosen for its central CBD location, the Intercontinental is close to everything on our Priority List: shops, restaurants and coffee shops. 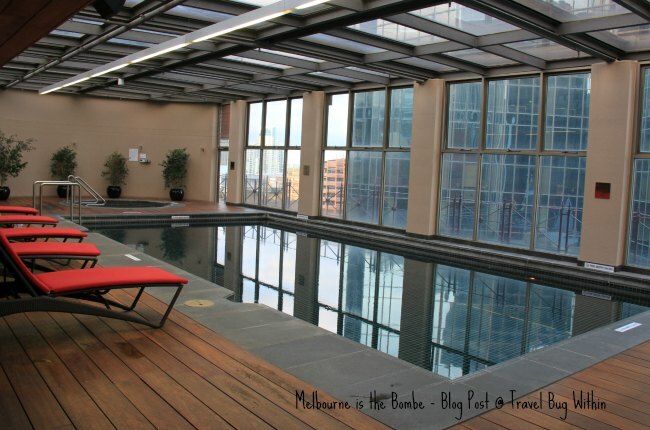 Entering the self-opening hotel doors, whether it was the welcoming greeting by the friendly concierges the grandeur of the foyer, or the pleasant signature scent, my gal pals and I knew not only the Melbourne weather was on our side, but the Hotel felt distinctively special. 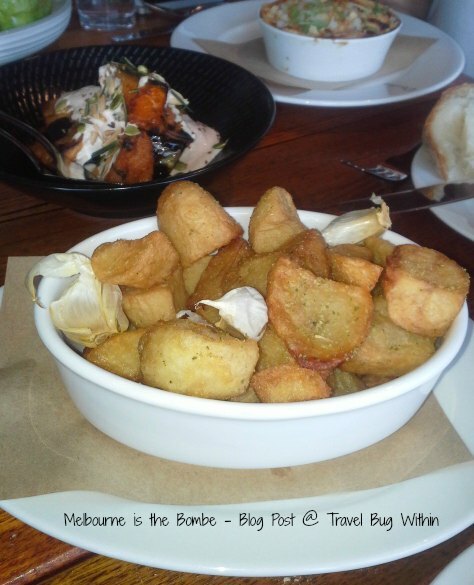 When I think of Melbourne I usually recall all the amazing food experiences I’ve consumed in this city brimming with culinary delights. With so many incredible dining choices, we wanted nothing less than maximum dining enjoyment over our two days. Facebook came to the rescue. Within a couple of hours posting a question about where to eat and what to do in Melbourne, I was inundated with interesting and diverse choices. The menu at The Spice Temple is extensive and we were a little confused by what we should order. There is chilli for the chilli lovers or subtle flavours for those desiring a more mild experience. Wished we had kept this in mind when ordering the Hunan Style Crisp pork belly with mushroom, soy and fresh and dried chilli. Nothing wrong with spicy as we were obviously in the wrong place if we desired non-spicy, but the chillies in this dish added more than a splash of colour to the night. The restaurant ambience was loud, but I was pretty sure I heard Slider say as he placed this dish on our table, we could eat these chillies. Bravado (or more likely stupidity) made me curious, but after the third one I knew I was in trouble – it was a painful”fire down the hole” scenario – more bubbles, please. 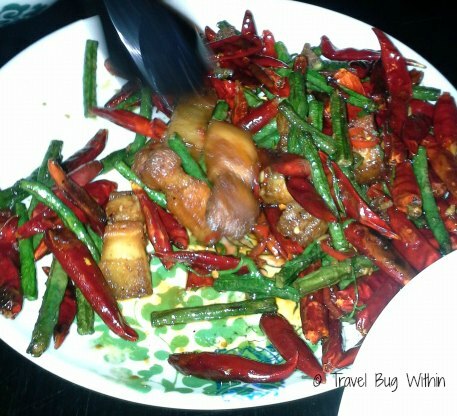 The Spice Temple’s Hunan Style Crisp Pork Belly with mushroom and just a “few” dried and fresh chillies. A post Spice Temple cocktail at the Crown Metropol rooftop bar and lounge – 28 – helped to cool things down. Said to be Melbourne’s highest bar (28 floors high) the view over the city skyline was impressive. For any Offspring fans remember to take a peek at their infinity pool featured in one of the series’ episodes. Did I sense the ghost of Patrick? No – but I’m sure the “one for the road” Baileys was taking effect. 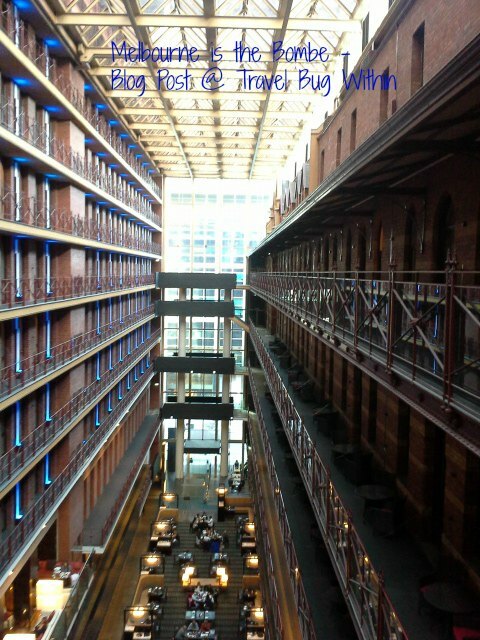 On Saturday we decided it was time to leave the CBD and the “confines” of our lovely Hotel. 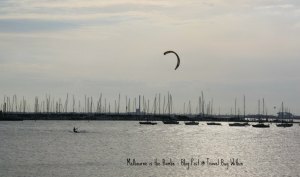 We caught a tram to St Kilda – No. 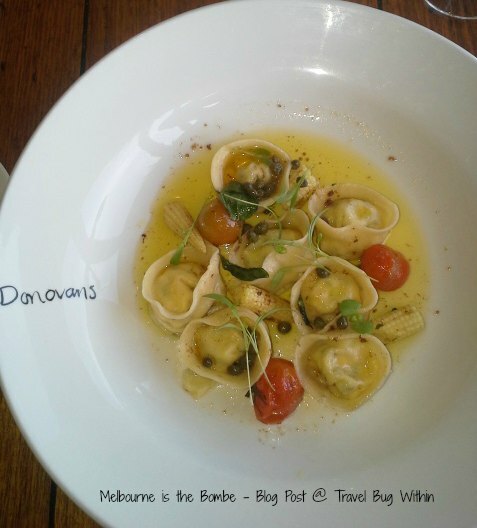 96 from Spencer Street, the destination Donovans on Jacka Boulevard for a long lunch by the seaside at one of Melbourne’s most popular dining destinations. Damaged by fire in August 2014, the beachside restaurant re-opened in early March 2015. (note must book a few weeks in advance.) The homely interior offers the perfect place to chill and the glass windows allow people watching as locals and visitors wander along the St Kilda promenade. Donovans menu is interesting and extensive, but conscious of the impending dessert scenario, I chose the sweet corn and goat’s cheese tortellini. I wasn’t disappointed with my choice, the flavours and combination of spices were mouth watering. The gals ordered a few sides including the house chips with whole garlic and rosemary sea salt. Friends, forget the diet and enjoy the carb overload – these are worth it! House Chips with whole garlic, rosemary and sea salt. Delicious! 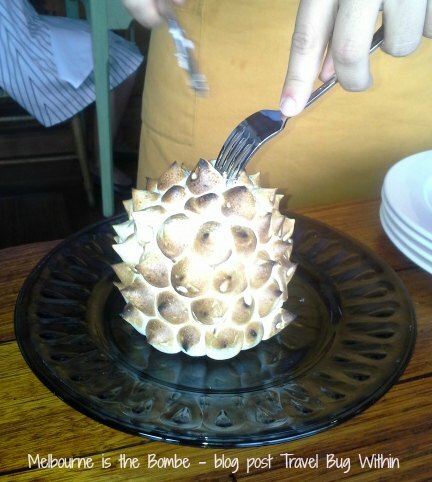 I’d read a review about their infamous Bombe Alaska dessert “It’s the I’ll-have-what-she’s-having dessert that’s been turning heads at Donovan’s since it appeared on the bayside restaurant’s menu 14 years ago.” (Herald Sun October 8th, 2014.) 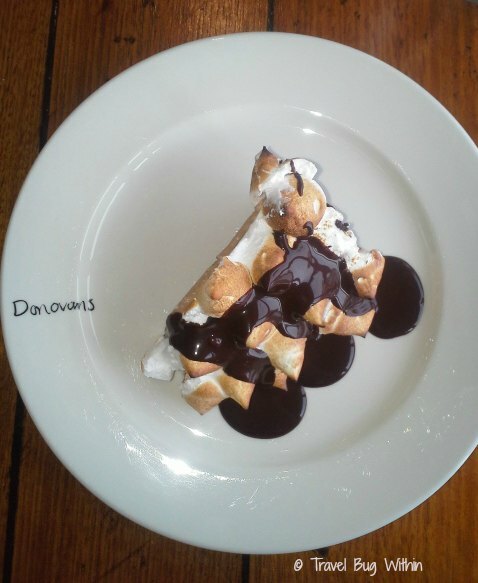 Any dessert still popular after 14 years and voted in the top 25 desserts in Melbourne, is one I am (very) keen to try and so were my gal pals. Our Bavarian waiter Michael was a little unsure when I said to him (with maybe too much enthusiasm) I cannot wait to try your signature dessert dish. Without missing a beat, Michael responded, “All our dishes are incredible and we get to try them all,” flashing his cheeky smile and twinkling blue eyes. For a moment I am infinitely jealous of this young international traveller. Not just for the gipsy travel life he leads (poor guy – at a table of very happy 50-year-old gals he was peppered with a few questions,) but the fact he not only has to try each of Donovan’s dishes, he must also try their extensive wine list. “It is important to be able to describe flavours accurately to the customers,” he says. 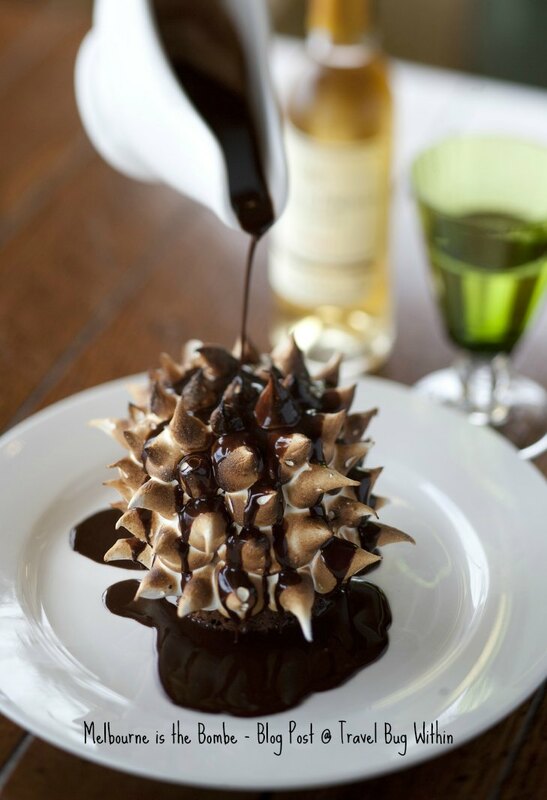 When the Bombe Alaska arrives (as it had to many other tables – proving its popularity) we have a “wow” moment. My photos do not do this dessert justice. I wasn’t sure I would enjoy the hazelnut ice cream centre as I am not a fan of chocolate ice-cream. 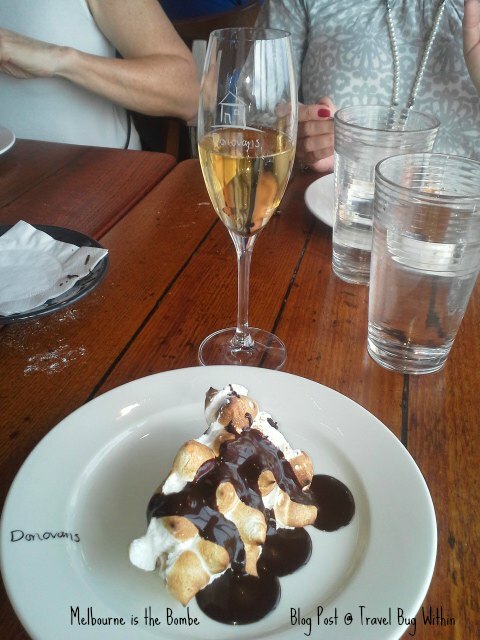 But I was in complete agreement with one of my gal pals, “the lightness of the meringue and the texture with the ice-cream is the perfect combination.” Oh, this dessert was most certainly the bombe – a beautiful combination of sweetness and light! We reluctantly depart the homely and comfortable confines of Donovans for a much-needed stroll along St Kilda beachfront boulevard, out along the pier and into the fairy penguin colony where we spy one lonely fairy penguin trying to shield himself from prying eyes. St Kilda is a popular place – but as the penguins know – there are quiet spots to be found! On Sunday as I was making a few last-minute purchases in the Haigh’s Chocolate shop, located (conveniently) next door to our Hotel, the Shop Assistant asked if I was from Melbourne. When I said no, he happily shared with me that Autumn is the best time of year in Melbourne. I tend to agree. 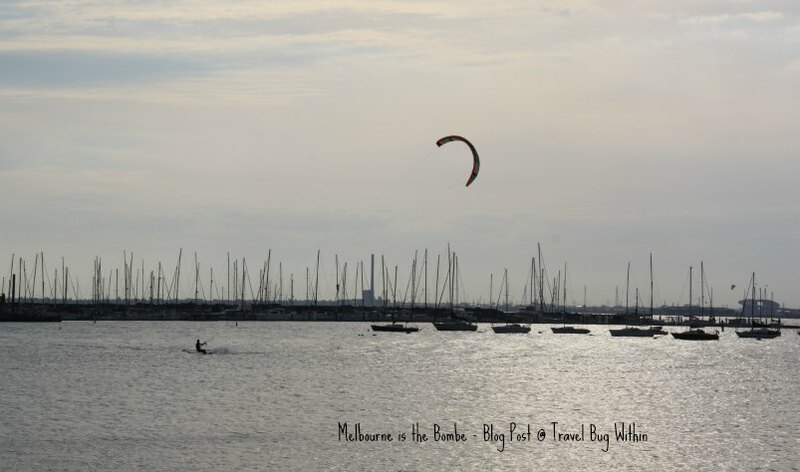 Melbourne did not disappoint in any way – our only complaint was the weekend came to an end way too fast and before we knew it we were back at the airport contemplating the unexciting choices of airport food before boarding our flight home. We made hurried farewells and promises we would not leave it so long between catch-ups, as we re-entered our busy lives. The good thing is there are a few more milestone birthdays to celebrate before the year ends. An opportunity to get off life’s busy treadmill, slow down and enjoy the delights of where ever we visit and the people we are with. Where shall we plan to celebrate the next one? A brilliant weekend, beautifully described! 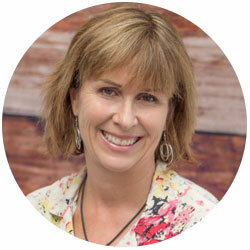 Thanks Catherine – love Melbourne, food, weather, style, Autumn trees, how easy it is to get around, then throw in fun and laughter = perfect escape! Looks like you had a fabulous time, I think it is important to take time like this every so often. And that dessert looks as incredible as it sounds!